(Austin, TX) –The Dell Medical School Family Residency Program at The University of Texas and a long-time downtown health clinic located next to the former Brackenridge Hospital are moving to the Central Health Southeast Health & Wellness Center. Central Health-funded CommUnityCare Blackstock Health Center moved from its downtown location to Southeast Austin on Monday, March 18, 2019, to make way for Central Health’s redevelopment of its Downtown Campus. Central Health is redeveloping the 14-acre site at 15th and Red River Streets to generate money to pay for health care for Travis County residents with low income. Blackstock is also the primary training site for Dell Med’s Family Medicine Residency Program, operated jointly with Ascension Seton. Moving Blackstock to Central Health Southeast Health & Wellness Center, 2901 Montopolis Drive, is expected to increase the center’s available primary care visit appointments from 12,000 to 20,000 annually. 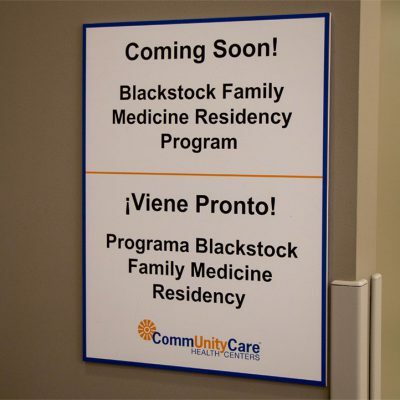 CommUnityCare acquired the Blackstock Family Health Center from Ascension Seton Family Health Centers in 2014. Since then, Blackstock has served as the primary training site and outpatient health clinic for Dell Med family medicine residents, while Ascension Seton hospitals continue to support the inpatient hospital training of our residents. The Blackstock family residency program is certified by the National Committee for Quality Assurance as a Level 3 patient-centered medical home where side-by-side faculty members and residents see patients. Moving the program to Central Health Southeast Health & Wellness Center will increase the capacity of primary care visits. “Integrating Dell Medical School students, residents and fellows into CommUnityCare creates a pipeline of culturally competent medical professionals that will care for Travis County residents with low income for years to come,” said Mike Geeslin, Central Health President and CEO. Central Health is the local public agency that connects Travis County residents with low income to quality health care. We work with a network of partners to eliminate health disparities and reach our vision of Travis County becoming a model healthy community.